Dec. 18, 2012: Crime scene tape stretches across the property outside the home where Adam Lanza lived with his mother, Nancy Lanza. Inside, police found weapons and other evidence. Five search warrants, which include lists of what detectives discovered in the first few days after the Dec. 14, 2012, mass shooting that left 20 school children and six educators dead, were made public. We'll embed them below. Though not overly graphic, they do include some details about what investigators saw when they discovered the body of Nancy Lanza, the gunman's mother, at the home. There isn't anything else said in the warrants about the photos of what appear to be a dead person, but it is noted that Lanza had saved a New York Times article about a shooting at Northern Illinois University. It's also reported that investigators found "one handwritten note pad with what appears to be to do lists for Nancy Lanza from December 14 through December 20." And they came upon an "Adam Lanza National Rifle Association certificate." While some computers, gaming consoles and other electronic devices were recovered, there was "a smashed hard drive on top of a desk in what is believed to be Adam Lanza's bedroom." He had a gun safe in the room, as well. A witness, whose name was redacted, told investigators that Lanza "rarely leaves his home." The Hartford Courant begins its report on the warrants this way: "Newtown shooter Adam Lanza kept an arsenal of guns, more than 1,000 rounds of ammunition, swords and knives at his home, search warrants released Thursday indicate." 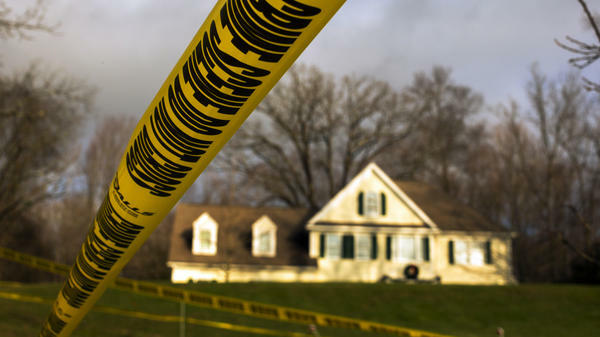 The Stamford Advocate leads with this: "Investigators found a trove of evidence ... seven journals and drawings, three photos of dead people covered in plastic and possibly blood, and a huge cache of ammunition scattered through the home. ... A gun safe and a military-style uniform were in his bedroom. Among other items in the home: three samuarai swords with blades ranging from 13 to 28 inches, 10 other knives, both X-box 360 and Sony Playstation game consoles and handwritten notes with locations of various gun shops." Also Thursday, as NBC Connecticut reports, Danbury State's Attorney Stephen Sedensky said Lanza's attack on those inside Sandy Hook Elementary School was over within about five minutes. It ended when the 20-year-old killed himself. "On the morning of December 14, 2012, Adam Lanza, the shooter, age 20, of 36 Yogananda St., Newtown, shot his mother, Nancy Lanza, age 52, in her bed with a .22 caliber rifle. There was no indication of a struggle. "Later the shooter went to Sandy Hook Elementary school where he shot his way into the building and killed 20 children and 6 adults with a Bushmaster .223 caliber model XM15 rifle. The Bushmaster was loaded with a 30-round capacity magazine. Fourteen rounds were in the magazine when the Bushmaster was recovered by police. There was one round in the chamber. "The shooter took his own life with a single shot from a Glock 10 mm handgun. He also had a loaded 9mm Sig Sauer P226 handgun on his person. Recovered from the person of the shooter, in addition to more ammunition for the handguns, were three, 30-round magazines for the Bushmaster, each containing 30 rounds. Located in the area of the shootings were six additional 30-round magazines containing 0, 0, 0, 10, 11, and 13 live rounds respectively. One-hundred-and-fifty-four spent .223 casings were recovered from the scene. "It is currently estimated that the time from when the shooter shot his way into the school until he took his own life was less than five minutes." Sedensky adds that "the guns used in the shootings were apparently all purchased by the shooter's mother. There is currently no indication that the shooter attempted to purchase the guns and was denied. The gun locker at 36 Yogananda St. was open when the police arrived. It was unlocked and there was no indication that it had been broken into." "The released search warrants were obtained on December 14, 15, 16, 2012, within a short time of the shootings. Subsequent investigation revealed that shootings took place in two of the classrooms, not three, and that the shooter was not wearing a bullet-proof vest, nor was he a teenager. Paragraph 5 of the December 16, 2012, warrant contains excess verbiage that was the result of incorporating information from prior search warrants. Finally, page numbers on returns do not necessarily follow the page listed before them as the returns are prepared after the warrant has been executed. The officer filling out the return may have used different equipment for the form which may result in discrepancies in the page numbering for the returns."